Washington, D.C., Oct. 13, 2009–The Washington International Horse Show (WIHS), a leading national equestrian event based in Washington, D.C., since 1958, is proud to announce a strong roster of corporate sponsors of the 2009 Washington International Horse Show at Verizon Center. WIHS welcomes The Boeing Company, Honeywell International Inc., Animal Planet, Chevron Corporation and Comcast among others. “We are thrilled to have this support, nearly half of the funds raised for the 2009 show have come from new corporate donors contributing cash and value-in-kind. In past years the majority of the show’s funding has come from private donors and foundations, so this broader base of both corporate and private funding will allow WIHS to build a stronger foundation for the future,” says Eric L. Straus, WIHS Chief Executive Officer. WIHS sponsorships including corporate and value-in-kind top one million for 2009. Boeing, Chevron and Honeywell, as well as Textron and Royal Bank of Canada, have committed support to WIHS. This support is specifically focused on providing complimentary admission to thousands of military family members who will attend the show this year. Animal Planet has worked as a WIHS partner and created and coordinated this year’s public relations and advertising campaign. “We believe this to be the best and most well received campaign in the 51-year history of WIHS,” noted Tony Hitchcock, WIHS Chief Operating Officer. Comcast joins WIHS with support as a major media partner and will provide extensive airing of the dynamic new WIHS TV commercial created by the Animal Planet-Discovery Channel team. New for 2009 is Comcast’s sponsorship of complimentary general admission for all children 12 & under at all WIHS performances before 5:00 P.M.
WIHS has developed new exhibitions and events to reach further into the local community audience to build the fan base for this equestrian event. “Our partnership with the Caisson Platoon, Horses and Humans Research Foundation, Autism Speaks and our youth and community initiatives have broadened our appeal and we are seeing wonderful results with an increase in sponsorship, media attention and we expect to see it with attendance as well,” says Straus. Also new this year is Sunday afternoon’s World of the Horse exhibition in which more than 12 different equestrian acts plus the show’s famed Terrier Races will showcase dressage, barrel racing, Friesians, sidesaddle, reining, the U.S. Park Police Mounted Patrol, and more - starting at 1:00 P.M.
Washington International Horse Show Association, Ltd. is a 501(c)(3) non-profit organization. The 51st WIHS will be held Oct. 20-25, 2009, at Verizon Center in Washington, D.C.
An equestrian tradition since 1958, the Washington International Horse Show brings horses and riders of all ages, including Olympic champions from all over the world, to the nation's capital for thrilling jumping competition and a chance to compete for more than $400,000 in prize money and championship titles. About 500 horses participate in show jumping, hunters, equitation and dressage events during the six-day show. Special exhibitions, boutique shopping and community and charity events round out this family-friendly show. 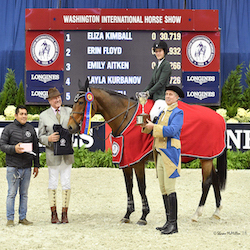 Since its debut, the Washington International Horse Show has been a popular Washington, D.C., fixture visited by presidents, first ladies, celebrities, business and military leaders, as well as countless horse enthusiasts of all ages. Tickets are available through Ticketmaster.com and at the Verizon Center box office and range in price from $10-$50. For more information, visit http://www.wihs.org.